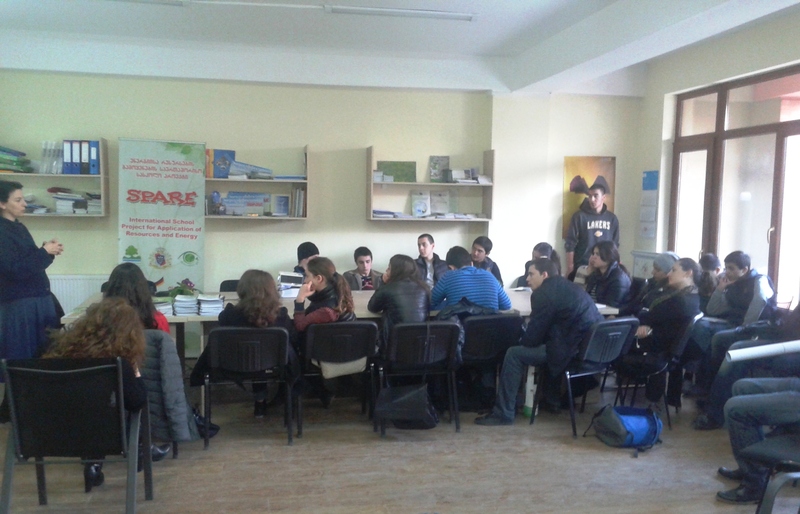 On February 20, 2014, in the framework of the project “Clean Up Georgia – Raising of Public Awareness and Involvement in Solid Waste Management Improvement ” (Phase II), Georgian Society of Nature Explorers “Orchis” arranged a Meeting in Gardabani Municipality with the participation of the representatives of Gardabani Municipality Sakrebulo and Gamgeoba, NGOs, LEPLs and others. On February 17, 2014, in the framework of the project “Clean Up Georgia – Raising of Public Awareness and Involvement in Solid Waste Management Improvement” (Phase II), Greens movement of Georgia/ Friends of the Earth Georgia arranged a seminar in lagodekhi Municipality, village Apeni with the participation of the representatives of local population and representatives of the youth centre, village trustee. 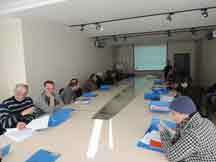 On February 18, 2014, in the framework of the project “Clean Up Georgia – Raising of Public Awareness and Involvement in Solid Waste Management Improvement ” (Phase II), Georgian Society of Nature Explorers “Orchis” arranged a Meeting in Dmanisi Municipality with the participation of the representatives of Dmanisi Municipality Sakrebulo and Gamgeoba, LTDs, NGOs and others. 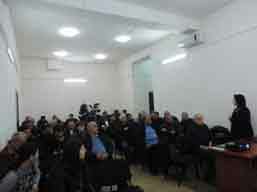 On February 17 , 2014, in the framework of the project “Clean Up Georgia – Raising of Public Awareness and Involvement in Solid Waste Management Improvement” (Phase II), Greens movement of Georgia/ Friends of the Earth Georgia arranged a seminar in Lagodekhi Municipality, at Gamgeoba building of village Leliani with the participation of the representatives of local population, and representatives of NGO “Leli.” Totally, 17 activists. 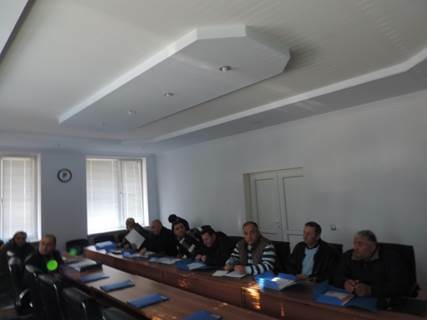 On February 13 and 14, 2014, in the framework of the project “Clean Up Georgia – Raising of Public Awareness and Involvement in Solid Waste Management Improvement” (Phase II), were arranged the meetings with the teachers of Khashuri and Kaspi Municipalities schools. 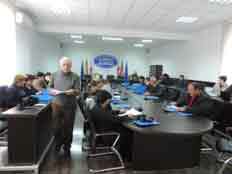 On February 13, 2014, in the office of NGO ‘Ecovision’ the meeting with private school ‘Logos’ students was arranged. The aim of the meeting was to raise public awareness of pupils in the field of environmental education and solid domestic waste management. 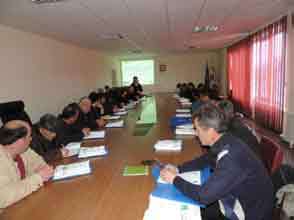 On February 12, 2014, in the framework of the project “Clean Up Georgia – Raising of Public Awareness and Involvement in Solid Waste Management Improvement ” (Phase II), Georgian Society of Nature Explorers “Orchis” arranged a Meeting in Marneuli Municipality with the participation of the representatives of Marneuli Municipality Sakrebulo and Gamgeoba, Local Authorities, LTDs, NGOs, mass media and others. On February 5, 2014, in the framework of the project “Clean Up Georgia – Raising of Public Awareness and Involvement in Solid Waste Management Improvement ” (Phase II), Georgian Society of Nature Explorers “Orchis” arranged a Meeting in Bolnisi Municipality with the participation of the representatives of Bolnisi Municipality Sakrebulo and Gamgeoba, Local Authorities, LTDs, NGOs, mass media and others. 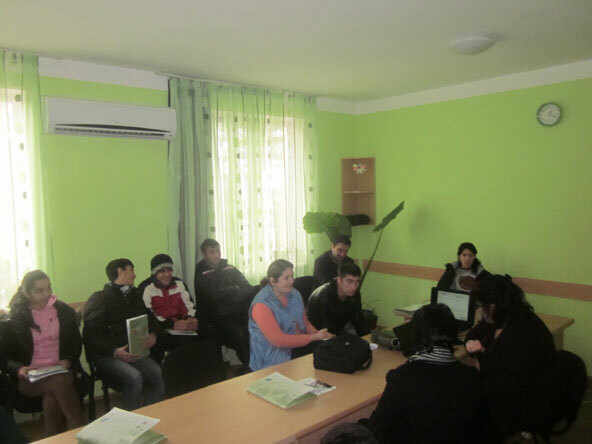 On January 30, 2014, in the framework of the project “Clean Up Georgia – Raising of Public Awareness and Involvement in Solid Waste Management Improvement ” (Phase II), Georgian Society of Nature Explorers “Orchis” arranged a Meeting in Khashuri Municipality with the participation of the representatives of Khashuri Municipality Sakrebulo and Gamgeoba, NGOs and others. 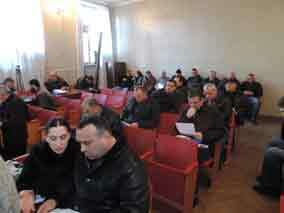 On January 29, 2014, in the framework of the project “Clean Up Georgia – Raising of Public Awareness and Involvement in Solid Waste Management Improvement ” (Phase II), Georgian Society of Nature Explorers “Orchis” arranged a Meeting in Gori Municipality with the participation of the representatives of Gori Municipality Sakrebulo and Gamgeoba, LTDs, NGOs, mass media and others. On January 24, 2014, in the framework of the project “Clean Up Georgia – Raising of Public Awareness and Involvement in Solid Waste Management Improvement ” (Phase II), Georgian Society of Nature Explorers “Orchis” arranged a Meeting in Kaspi Municipality with the participation of the representatives of Kaspi Municipality Sakrebulo and Gamgeoba, Local Authorities, LTDs and others. 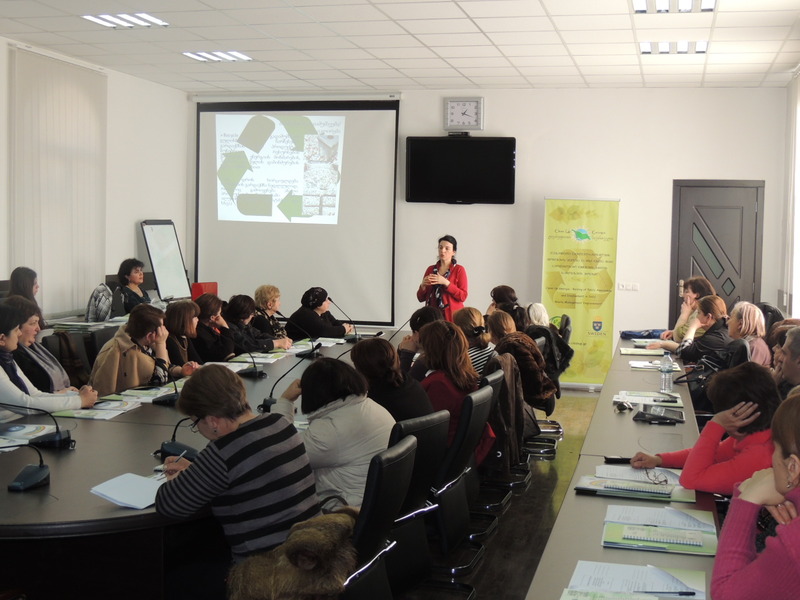 On 20 January, 2014, under the initiative of the Terjola regional group of Greens Movement of Georgia / Friends of the Earth Georgia and with the support of local and the self government authorities in the framework of the project “Clean Up Georgia – Raising of Public Awareness and Involvement in Solid Waste Management Improvement” (Phase II), a large - scale Clean Up action has been arranged. On January 17, 2014, in the framework of the project “Clean Up Georgia – Raising of Public Awareness and Involvement in Solid Waste Management Improvement ” (Phase II), Georgian Society of Nature Explorers “Orchis” arranged a Meeting in Kareli Municipality with the participation of the representatives of Kareli Municipality Sakrebulo and Gamgeoba, Local Authorities, LTDs, NGOs, mass media and others. On January 10, 2014, in the framework of the project “Clean Up Georgia – Raising of Public Awareness and Involvement in Solid Waste Management Improvement ” (Phase II), Georgian Society of Nature Explorers “Orchis” arranged a Meeting in Lagodekhi Municipality with the participation of the representatives of Lagodekhi Municipality Sakrebulo and Gamgeoba, Local Authorities, LTDs, NGOs, and others. On December 23, 2013, in the framework of the project “Clean Up Georgia – Raising of Public Awareness and Involvement in Solid Waste Management Improvement ” (Phase II), Georgian Society of Nature Explorers “Orchis” arranged a Meeting in Dedoplistskaro Municipality with the participation of the representatives of Dedoplistskaro Municipality Sakrebulo and Gamgeoba, Local Authorities, LTDs, NGOs, and others.